When the Wildwood was launched, it came with a worthy book, detailing a lot of things about this earthy deck. 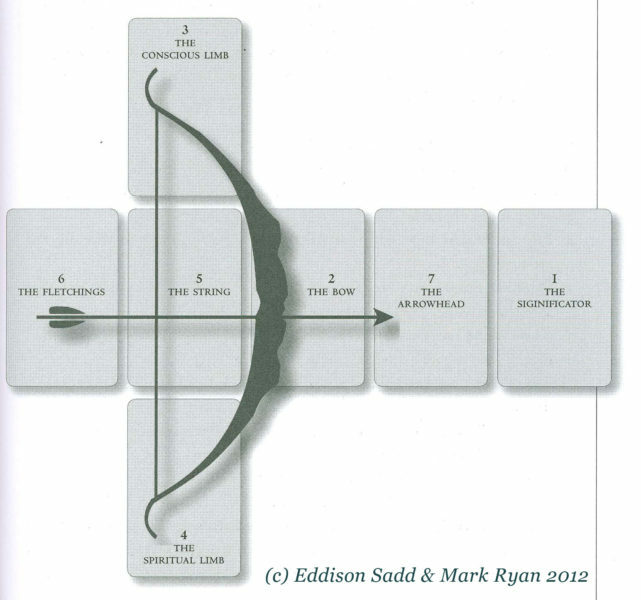 One of the sections has the spreads that Mark designed for this deck & I’ve chosen to illustrate the Bow Spread for you with this week’s question. 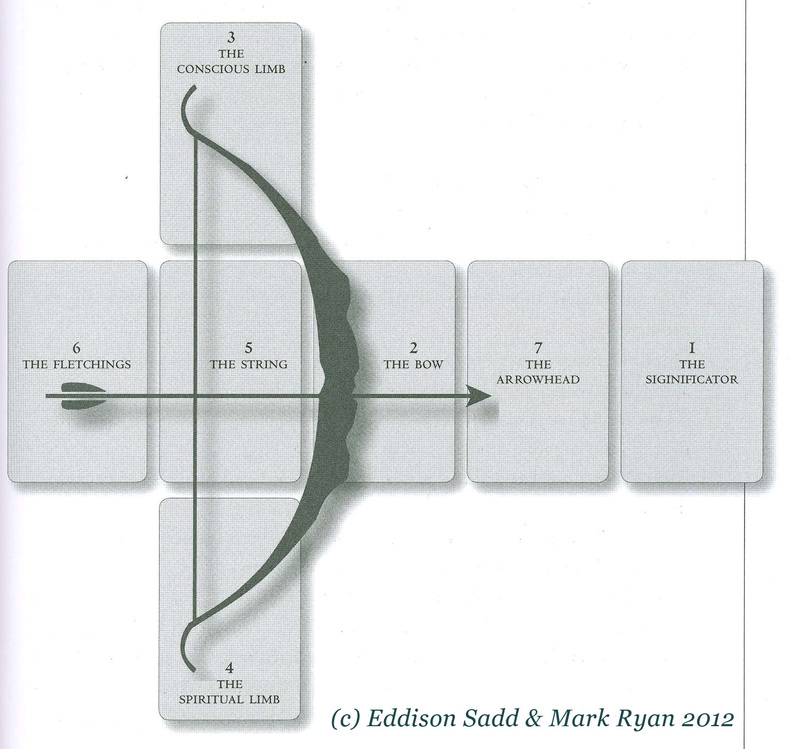 There are some of the spreads that I have used, like the Pathway Spread (which is 3 cards) but the whole Bow Spread I know isn’t printed the way Mark wanted it. The second card, The Bow, is actually raised above the line the spread on page 145 shows it as. (Yes, I’ve made a note in my book so I know). Remember when I said above that the bow card is supposed to be raised to represent the actual bow. 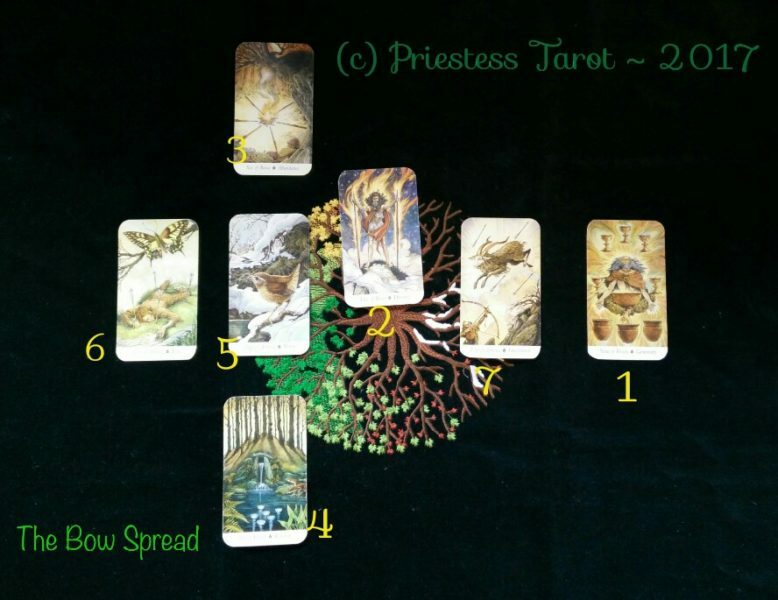 Please do try this spread for yourself, I have, which you can read below. It’s not just for use with The Wildwood. Try this with the Thoth or another straight talking deck. The question I asked was simple. What do I need to be aware of during this Equinox? The Issue is my peace. I feel it’s been violated and I know why; because my barriers aren’t up. I do need to re-learn how to do this, so I can regain my peace. Unfortunately, it’s not as easy as just putting up psychic barriers. What my focus is on the issue, is undecided. What option do I choose here? Do something or do nothing? If I do choose to do something, what is it I choose to do? There are a lot of questions I need answers to, but the cards do give me a way to sort my head out. Read on. What do I think? Remember how abundant we are. The “we” here is my family. We forget sometimes how lucky we are here in the First World. There is food, warm shelter, clothes, beds with sheets that are fresh and can be cleaned. This card reminds me to be grateful for those items in my life. I also include the kids & hubby here, even if they do add to the home chores! What do I feel? The 6 of Vessels tells me I want things back to how they were. I want my sanity & peace back, but I can’t rewind time. So I have to remind myself that this situation whilst temporary, will change; it always does. What drives the issue? Page of Arrows… Now, this I do have issues with. It’s the communications I have issues with. It’s the fact that people decide on what’s real, based only on what they’re told. I really wish they’d be adult enough to work things out on their own. Rather than talk like adults, the others in question here have decided and act upon falsehoods & not in a friendly way either. What’s the likely outcome? The frustrations or other people’s thoughts shouldn’t hold me back, I should fly above them and not let them hold me back or on me down. To give up is to let them win & whilst I am tenacious, I can’t give up. I need to keep going to keep above those arrows & keep leaping along in my life. The last cards are the ones I want (& need) to carry forwards with me. Time is my friend, I can only hope that the penny will drop at some point & the lights will go on. The when isn’t down to me, yet I just have to trust that it will. I hate waiting, though I honestly do. I’d love your thoughts on these cards, let me know how this spread works for you. If you’d like your own reading, you can book it right here. I’ve used The Wildwood card & text from the first edition book, with permission from the creators.